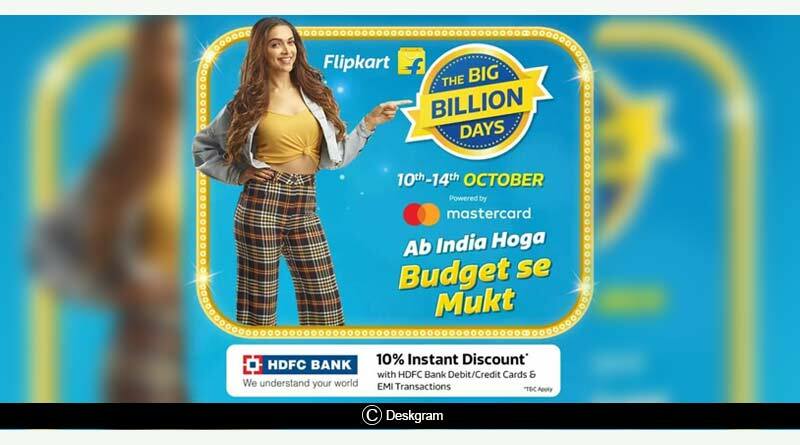 Starting off Wednesday midnight, Flipkart Big Billion Days Sale October 2018 is here with some lucrative and eye-catching offers, deals and discounts. A wide range of products on one of India’s biggest e-commerce site is up for grabs at unbelievable prices during Flipkart’s annual sale. The festive sale sees Flipkart dish out mouth-watering offers on smartphones, utility home appliances, laptops, TVs, kitchen tools and gadgets. Partnering up with celebrities like Amitabh Bachchan, Deepika Padukone, Virat Kohli, and others as well as developing technological innovations to create engaging personalized content for social media, Flipkart has gone all out to woo customers this sale. The online marketplace giant has divided its sale into two categories with 10-12 October seeing the company offer discounts on fashion, TVs & appliances, home, and furniture, beauty, and sports. October 11-14 will see categories of mobile, tablets, electronic devices, and accessories opening up in Flipkart’s Big Billion Days sale October 2018. Flipkart’s massive sale offers not only great rates but also come with fantastic bundled offers. Low-cost EMIs and exchange offers are delightful incentives which will surely make your shopping experience even more pleasant. With the festive time being considered extremely auspicious to buy new products, we bring you the best offers and deals available on Flipkart’s Big Billion Days Sale which you can avail to bring your favorite product home. Xiaomi’s Mi Mix 2 smartphone will be available at a discounted price of Rs 22,999, seeing a price drop of Rs.7,000.With 6GB RAM and a 128GB storage option, the smartphone is excellent value for money. Flipkart’s biggest deal on smartphones is offering customers the Xiaomi Redmi Note 5 Pro at just Rs. 1,299 or a Realme device at as low as Rs. 1,500 per month. Xiaomi’s sub-brand, Poco’s Poco F1 will be available for a cheap dirt price of Rs.5,799. Flipkart is also offering a flat 70% buyback offer on the Poco F1. Flipkart has rolled out discounts of up to 80% on its extensive range of television sets. The much loved and purchased MI TVs will be available during the sale with the company offering the Mi LED Smart TV 4A (32), Mi LED Smart TV 4A (43) and Mi LED TV 4 PRO (55), dropping the price of the 4A (32) and 4A (43) models by Rs 500 and Rs 2,000 respectively. These two TVs will be available for Rs 13,499 and Rs 20,999 respectively and are a steal at these rates. Heavy and small appliances see massive discounts on Flipkart for the next 5 days. Refrigerators from top brands like LG and Haier start from Rs.9,299 while washing-machines are available from the same starting price of Rs.9,299 from brands like Samsung and LG. Flipkart also offers great value exchange offers that help you get rid of your old products at decent prices. For more details on Flipkart Big Billion Days Sale October 2018 and other related updates, like and subscribe to tentaran.com.